MyHub and partner One Education Music are passionate about music education including the field of electronic music and music technology. We have already enabled and empowered many children and young people in this important area of music and the music industry. Our latest initiative is an exciting partnership project with music production software company Ableton Live funded by Manchester Youth Music Hub. Specifically targeting secondary schools, Ableton Live software is an industry standard alternative to software like Logic Pro or Cubase, with its own hardware controller called the “Push”. Originally designed for DJs, this software has a system and interface which lends itself to music performance and production without using a mouse and computer keyboard. So far we have worked with Year 7-9 students at Lancasterian School, William Hulme Grammar and The East Manchester Academy (TEMA). A 5-week course was designed by electronic music specialist Caro C where students learned how to use the Ableton software and Push Controller to make their own music, bringing together both electronic and acoustic elements. 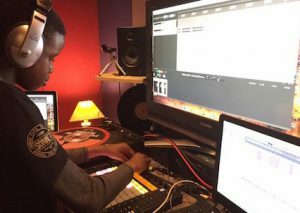 Students from William Hulme Grammar and TEMA then spent a day at Reform Radio in May 2018 to produce their own radio show and perform their tracks made using the Ableton Push controller. The students democratically came up with the catchy radio show title “Push Pad Pioneers” themselves.